Folders are folders are folders – right? Not neccesarily. We have curated some interesting samples off Pinterest to prove otherwise. It’s not about how colourful it is, sometimes less is definitely more. A limited colour palette combined with one or more special finishes can create something really unique and eye-catching. Try printing on a TEXTURED CARD (we like 280gsm Natural Evolution) or use a TINTED CARD like 325gsm Liner board and apply KISS CUT DECALS to embellish your folder or seal it closed. Applying a SPOT GLOSS VARNISH to a plain white background will catch your eye as it offers subtle changes in different light. Another way to get attention and add a third dimension, is to LASER CUT some detail out of the covers. This can be done with almost any stock with great effect. Chat to us about pricing on this new service. The great news is that we can offer a digital one stop solution for both spot gloss varnish and laser cut finishes! 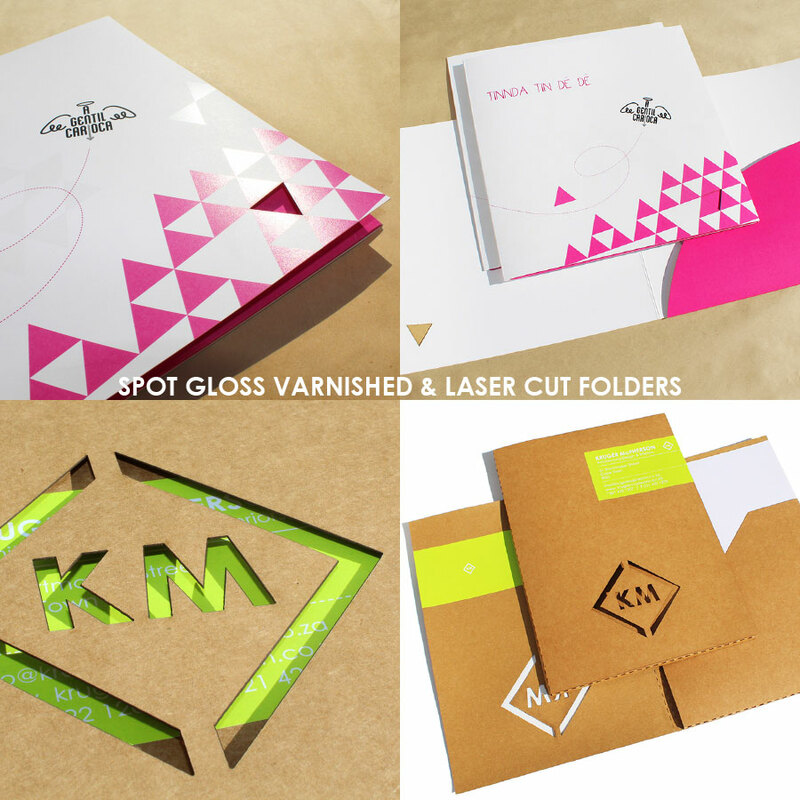 Once the realm of high volume, high price tag print runs only, these effects can now be applied both swiftly and cost effectively, even to short runs of laser printed folders.